I was so gratified by the latest five-star Amazon customer reviews of my second historical novel, Mariano’s Choice, that in a moment of madness I decided to offer a holiday gift sale: 10% off on each book, or 15% off if you buy both books. You have to order from my website, davidmjessup.com/books, for this discount. For once, my site is cheaper than Amazon! Music to an author’s ears. Is courage something learned or is it in our DNA? Can we control it? 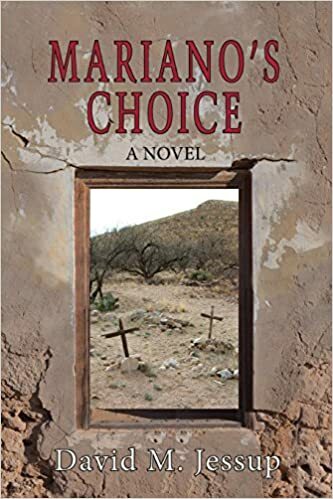 Based on a true story, Mariano’s Choice (Pronghorn Press, $19.95) follows Mariano Medina’s quest for courage and respect—growing from a cowardly teenager to a mountain man who, at long last, learns to stand up for those he loves. Not your stereotypical Western “hero,” Mariano changes with the challenges life throws at him. At first blush it’s hard to like Mariano. But within a matter of pages, he blossoms into someone you truly care about. Set in the mountain West, northern New Mexico and up to Wyoming’s South Pass and Fort Bridger, author David Jessup’s fluid and compelling prose of early 1800s fur trappers pulls the reader into a time and place rarely written about. The attention to detail and obvious research Jessup has done brings an unparalleled richness to the story. Where are the bodies buried? That question still haunts the graveyard of Mariano Medina, Loveland, Colorado’s first settler. The cemetery was torn down in January 1960 to make way for development. Thanks to Bill Meirath and others in the Loveland Historical Society, the Medina Cemetery has been restored. But the question lingers: whose remains are still buried there? Read Ken Jessen’s third article in his series about the Medina Cemetery. One of the names on the new marker is that if Marcelina (Lena) Medina, Mariano’s young daughter who tragically died shortly after her 15th birthday. Whether her real bones rest there is a mystery. According to one early pioneer recollection, Lena’s body was stolen from their house on the Big Thompson River and spirited off by her mother for a secret burial on a ridge to the west. That incident became the initial scene in my historical novel, Mariano’s Crossing, published by Pronghorn Press in 2012. Shameless Self-Promotion: Buy my books for holiday gifts! Holiday gift time is just around the corner. Allow me to suggest my historical novels, Mariano’s Choice (just published) and Mariano’s Crossing, as great holiday gifts for people who love to read. Order from Amazon or any other local or online bookstore. Autographed copies can be ordered from my website: www.davidmjessup.com. Check out the nice endorsements from Anne Hillerman, Sandra Dallas, Laura Pritchett and other authors who write stirring fiction set in the American West. http://www.davidmjessup.com/images/Signature-David-J-just-one-for-inserting-1-300x119.jpg 0 0 David Jessup http://www.davidmjessup.com/images/Signature-David-J-just-one-for-inserting-1-300x119.jpg David Jessup2016-11-29 15:08:392016-11-29 15:08:39Shameless Self-Promotion: Buy my books for holiday gifts! Here’s the Press release that just went out on my upcoming presentation of Mariano’s Choice at the Loveland Museum at 5:30 PM on Thursday, Nov. 17. If you’re in the neighborhood, drop in and say hi! Also, the Loveland Library is having a local author’s day tomorrow, Nov. 12, from 1-4 PM. You’ll see my smiling face there too. Author David Jessup Blends Colorado History, Fiction in November 17 Talk. Author David Jessup brings Colorado history to life in his latest novel about Mariano Medina, Loveland’s first settler. 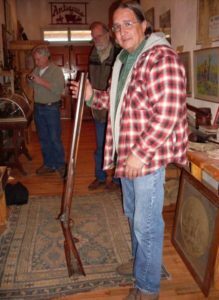 His presentation at the Loveland Museum on November 17 features photos of the real characters who lived on the frontier during the lead up to America’s 1846 war with Mexico. 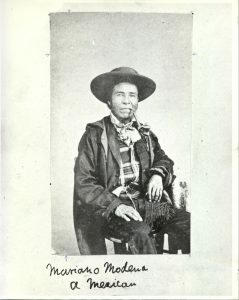 Mariano Medina is most well-known for having saved a U.S. Army brigade that attempted to cross the Colorado mountains during the Mormon War in 1857. While history does make some account of Medina’s adult life, little is known about the childhood of a man known for his grit, tough nature and courage. That’s where Jessup’s story begins in Mariano’s Choice. In Jessup’s fictional version, young Mariano Medina witnesses a vicious attack on a girl he adores and flees in inexplicable terror. Fifteen years later, as a grown man training horses along the Oregon Trail, he has a chance to redeem himself if he can overcome his cowardly urge to flee. His choice will lead Medina back to the land of his childhood, where he must confront his darkest fears and uncover the hidden source of his panic in the ghostly stare that haunts his dreams. Jessup’s talk and book reading is scheduled for 5:30 PM on Thursday, November 17th, 2016, at the Loveland Museum, 503 North Lincoln Avenue. There is no charge, and no registration is necessary. Proceeds from book sales will support the Loveland Museum and the Loveland Historical Society, which will also accept donations at the event. For more information about the book, visit www.davidmjessup.com. The book can be purchased in advance at the Museum and at the event itself, or ordered from local and online book stores. Images of the book cover and an author bio are attached. Ah, the choices we make. In Mariano Medina’s case, h is was to “Run! Get away!” when he witnesses an attack on a girl, the daughter of his patrón. But then he was only 15 and outnumbered by the ruthless men who hunt him down. Still his inability to stop the attack haunts Mariano into his adulthood. Author David M. Jessup sets his novel in the first half of the 1800s in the very Wild West. He uses real people for a few of his characters — such as Mariano, who rescued an Army brigade trying to cross Colorado during the winter of 1857 — and then has his way with them. The novel begins in Taos, where Mariano is a stable boy for a wealthy patrón. During the 15 years following the aforementioned attack, Mariano wanders the frontier, working with trappers and traders. He is skilled at training horses and mules although not as natural as Takánsy, the Indian woman he hires to help him ready a herd for a group of Oregon travelers. Mariano encounters good guys, like his buddy, Tim Goodale, and the savvy French trader, Papín, and bad guys, such as the son of his former patrón. His courage is tested when he risks his life to save Takánsy from a band of Utes. Then there is his return to the Taos area, where he must finally face his past. It’s been a while since I picked up historical fiction by choice. But Jessup makes his novel work handsomely with a good tempo and an authority that is convincing. He takes readers on a very satisfying ride into the past. Jessup, a rancher in Colorado, also wrote Mariano’s Crossing. This novel is its prequel. “Mariano’s Choice,” at 249 pages, is available from Pronghorn Press (pronghornpress.org) for $19.95 in paperback. Just prior to the successful launch of Mariano’s Choice, my second historical novel, an interview was published in the Loveland Reporter-Herald September 25, 2016. Excerpts below. The original can be viewed here. …”This (new book) goes back to [Mariano Medina’s] early life starting in Taos, N.M., when he was a 15-year-old boy and proceeding up to when it joins the first book in 1860,” he said of the new book. Jessup writes historical fiction. Based on historical events, Jessup fills in the blanks with fiction. Most of the characters he features in the story were real people in the real locations. Jessup will be having a book launch at 8 a.m. Oct. 1 at Sylvan Dale Ranch, 2939 N. County Road 31D, Loveland, which he co-owns. …”I became fascinated with this man and his family for two reasons,” he said. The first was that Medina became quite successful in a time that many had ill feeling toward Mexicans following the Mexican-American War, Jessup said. “I always wondered what it would have been like for him and the other European settlers in the valley to have this Mexican fellow be top dog,” he said. The second reason …There was an oral history that following the death of Medina’s 15-year-old daughter, his wife Takansy (some historians spell her name Tacancy) took the girl’s body up the mountains for a secret burial. It intrigued Jessup that a couple that had been together for 28 years and had their own cemetery would have this conflict. The new book focuses on how Medina became the man that he was. Jessup said in historical accounts he was described by others as a tough. “How did he get that way? Was he born tough and resourceful or, in my imagination, I wondered, it would be interesting if he was timid as a young man and cowardly and how might he overcome that cowardice or timidness to become the man he became,” Jessup said. He wanted to explore Medina’s relationship with Takansy as well. “Mariano purchased her from her first husband for, what was then, a very high price and so I wondered, wow, he must have felt quite passionately about her,” he said. 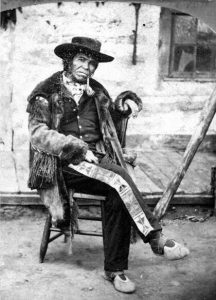 Medina traded six horses and six blankets in 1844 to Takansy’s husband, a French fur trapper. “The facts of history raise questions in my mind,” he said. As Jessup wrote the book he found a central theme emerge. “You don’t always know the central theme of the book when you start writing it. For me, what became the theme of the book was overcoming fear and cowardice,” he said. How did a young man grow into the fierce mountain man that history knows today. “To me, it was just a matter of: Was he going to be brave and tough from the get go? That didn’t sound very interesting,” he said. Jessup said, as the name of the book implies, Medina will face [a] few dilemmas along the way. October first, 2016, was one of those magically beautiful Colorado autumn days that blessed the thirty participants in our sold-out historic sites tour for the launch of my new historical novel, Mariano’s Choice. On our first stop, we visited the ruins of the old Weldon school in Sylvan Dale Ranch’s Big Valley. Then our vehicle caravan ascended the old quarry road on Red Ridge, the fictional site of Lena Medina’s secret grave, to peer over the edge of the towering cliff where a golden eagle soared over the valley below. Next we drove to Namaqua Park, site of Mariano’s original trading post and stagecoach stop, then on to the restored Medina cemetery, where tour members got a chance to heft a replica of Medina’s Hawken rifle and learn more about Mariano Medina from Loveland Historical Society members Bill Meirath and Sharon Danhauer. After returning to Sylvan Dale for Lunch, I presented my slide show introduction of Mariano’s Choice and read an excerpt from the new book. For me, that quote sums up the fictional journey traveled by my main character, Mariano Medina, one of the West’s legendary mountain men. So much has been written about the OK Corral I almost passed this book up. Now I consider Epitaph one of the best historical novels on the American West I’ve ever read. Historical fiction often suffers when authors dwell too much on historical fact at the expense of a good story, or as in the case of most accounts of the OK Corral, allow the fiction to run away from the facts. Mary Doria Russel achieves a perfect balance. Learn and be entertained at the same time. It’s “edutainment” at its best.